Green Tree Court is a luxury nursing and residential care home, situated on the outskirts of the historic city of Exeter in Devon. Rated ‘Outstanding’ by the Care Quality Commission and awarded the ‘Gold Standard’ for Dementia Care by Stirling University, Green Tree Court is the perfect place to live for people who need the highest standards of support and care. The reassurance of outstanding, person-centred clinical care around the clock is always at the heart of Green Tree Court. 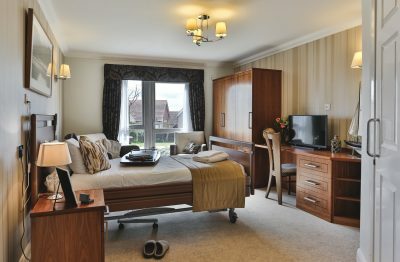 However, we also wanted to change traditional perceptions of what it’s like to live in a care home. To do this, we looked to boutique hotels and world-class luxury resorts for inspiration. We conceived, designed and built this home, specifically to create a sanctuary for our discerning residents, with standards of living that not only meet, but also surpass expectations. From practical features like lighting and floor plans to luxurious touches, like our aquarium and grand piano; every facet has been carefully considered to be the best you can imagine. To provide excellent service, you need an outstanding team. We’re co-owned, managed and led by experienced nurses who use state-of-the-art equipment for diagnostics, treatment and care. And our clinical team are ably supported by carefully vetted and trained healthcare assistants, caterers and front-of-house staff. We are here to attend your every need, from helping you to send presents to the grandchildren to arranging activities to keep you active. We know that stimulation and entertainment help to maintain physical and emotional well-being. So we organise activities in and outside the home, and we regularly welcome lots of visitors, from the children at our local pre-school to llamas! Every detail of our award-winning purpose-built home is custom designed, drawing on trusted experts and years of experience. With excellent food, highly trained and carefully selected staff and a plethora of services and activities, we’ve created a safe, happy and vibrant place in which our residents thrive. Get in touch to find out more. Our bright, welcoming interior design, luxurious surroundings and state-of-the-art facilities make Green Tree Court a very special place to visit. However, it’s the brilliant people who work here who make Green Tree Court a home where people want to live. And t is our wonderful team that make this such a special place. We only hire experienced, compassionate and properly qualified staff. This means that our residents and their families can trust us but it also ensures that we can nurture a culture of trust and support for the people we employ. Thanks to the professionalism and dedication of our people, we’ve also been rated ‘outstanding’ by the Care Quality Commission. If you’re looking for care home vacancies in Exeter, and want to work in an ‘outstanding’ home, please get in touch. We are always keen to meet potential new members of our team. 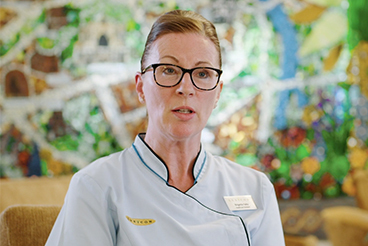 We have a broad spectrum of different specialists in roles that include nurses of all grades, kitchen staff, administrators, healthcare assistants, therapists and ‘front of house’ hosts. If you join us, you’ll discover a nurturing, supportive environment for all our staff at every level. We want you to become the best you can, so we provide plenty of opportunities for training and personal development. And we offer generous salaries, holidays, and enhancements to those who match our exacting standards. Whether you work with us in our clinical team or help with the many tasks that ensure Green Tree Court runs smoothly, you’ll find our home is a vibrant, rewarding place to live and work. 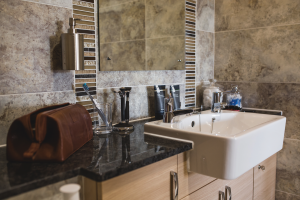 We also passionately believe that time is one of the biggest luxuries we can give to our residents. That’s why we manage our team to ensure our staff can usually stop for a chat with a resident or their family member. What’s the team like Green Tree Court? If you’re compassionate, attentive, enjoy caring for people and have a good sense of humour, then you’ll fit in perfectly with our wonderful team! To provide the continual level of excellence in care we expect, we regularly invest in training and development for our staff members. Everyone on our team is offered the opportunity to refresh their skills and develop new competencies on a regular basis. Healthcare assistants are provided with the chance to work towards their NVQ qualification in Health and Social Care, while Registered Nurses can develop their specialist skills, especially in the area of dementia care. Take a look at our current care home vacancies below. Our carefully selected nursing and care team set the benchmark for top quality care. Our professional nursing backgrounds underpin our commitment to protecting your dignity at all times. All our care, whether it is helping you to get ready for lunch or making sure you take any medication at the right time, is entirely personalised to your specific needs. 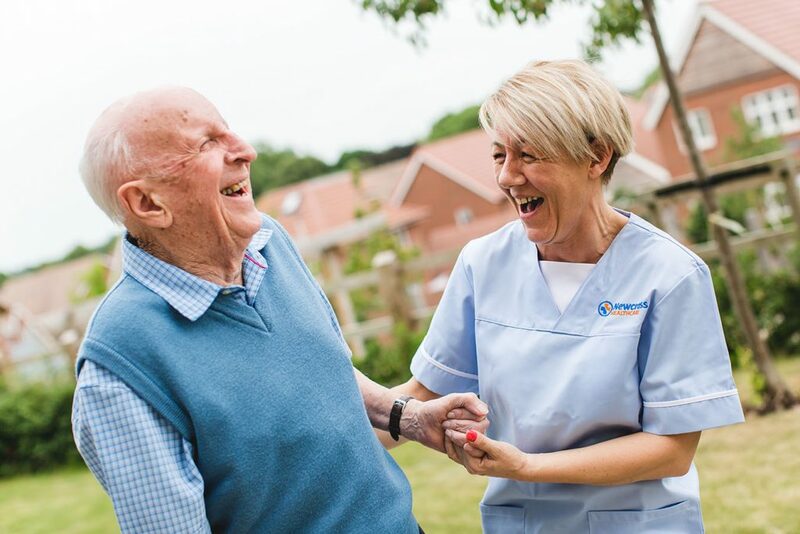 Depending on whether you’re looking for a residential care home, nursing care or specialist dementia care, you’ll find our compassionate team has the professional and personal skills to keep you comfortable and safe. We’ll take the time to listen to you and your family – and we’re here to answer any questions you or your family may have. Our stringent recruitment process means we only employ staff members who have the required skills and experience. A passion for delivering exceptional customer service and upholding our philosophy of care is also essential. When a new member of staff joins our team, we have a process in place to help them quickly get to grips with how we do things at Green Tree Court. And that makes a real difference to our residents and other staff members as it contributes to keeping everything running smoothly. Our induction process covers all the practical day-to-day aspects of the job. It’s also our chance to outline the high level of service we expect to maintain our happy and harmonious atmosphere. To provide a consistently excellent level of care, we invest in regular training and personal development for our team. That means our team is always up to date with the latest thinking on care. It also promotes better job satisfaction, which benefits all our residents and the rest of the staff too. 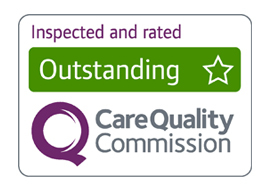 We’re delighted to have been rated ‘Outstanding’ by the independent regulator, the Care Quality Commission. You can read their full report here. We believe in providing the highest levels of personalised clinical care and attention to keep you safe and comfortable whatever your healthcare needs. But Green Tree Court is not ‘clinical’. 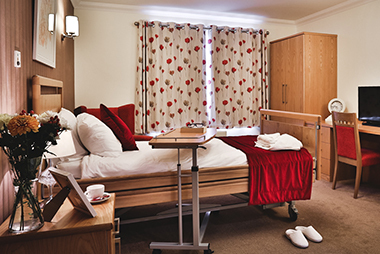 It doesn’t feel like a hospital and is profoundly different to the majority of care homes you might have encountered. Instead, we’ve considered what’s important in one’s own home; paying particular attention to the furnishings, the decoration and above all, the atmosphere. 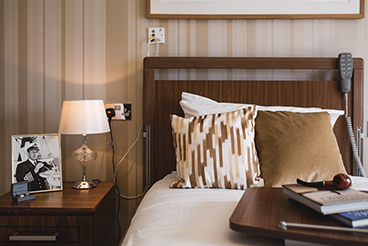 When you step through our doors you’ll feel like you’ve walked into a friendly, vibrant boutique hotel but outstanding clinical care is always present. Our philosophy is to provide a luxurious, stimulating, safe and caring environment that will meet the individual clinical, physical and emotional needs of everyone in our care. Residents are encouraged to maintain their independence and to prolong their vitality, personal interests, dignity and self-esteem. We only employ exceptional people who live and breathe our values; skilled, compassionate individuals who promote dignity and wellbeing for every one of our that residents. We train and assess our staff to the highest standards, ensuring everyone has the skills, knowledge and supervision to support and care for the residents of our home. Green Tree Court staff are motivated, managed, recognised and rewarded for excellence. We actively promote a culture of excellence, teamwork and pride in our work. Resident’s safety, comfort and wellbeing are always paramount. We never cut corners in our time or resources ensuring peace of mind for both those who live at Green Tree Court and their loved ones. Using locally-sourced, fresh ingredients our kitchen staff and dieticians ensure residents always enjoy nutritious, delicious meals of their choice wherever and whenever they want them. With clinical and personal care, we maintain a quality of life that maximises the potential of every resident; fostering social interaction, intellectual stimulation and a meaningful experiences. 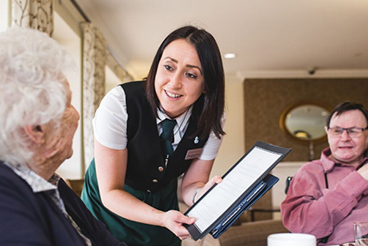 Our staff help to preserve the dignity and self-respect of the individual through the highest standards of care, recognising the talents, the tastes and the preferences of each resident. We’re good listeners and we’re empathetic. We provide support and build confidence with patience, assurance and by protecting each resident’s individuality and freedom of choice. We recognise that the right of privacy is a fundamental right for all individuals, including the need to respect the confidential nature of information relating to the resident, their family and friends. We appreciate that Green Tree Court is home for our residents. We always maintain a friendly, welcoming environment for our residents’ families and friends. We ensure that family and friends are kept up to date with residents’ circumstances and wellbeing. Moreover, with the residents’ permission, loved ones are always consulted when there are any proposed changes to care plans. Green Tree Court fosters tolerance and understanding, protecting the dignity of each individual and being mindful of lifestyle, cultural and religious needs of residents and staff. We work in a collaborative and cooperative manner with all health and social care professionals involved in maintaining each resident’s wellbeing. We maintain strong, close links with external clinicians and statutory bodies and respect their contribution to our team.